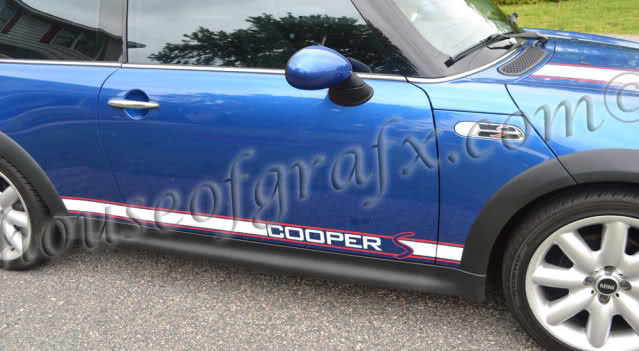 You are buying a pair (drivers side & passengers sdie) of 2 color Cooper S rocker stripes for any year Cooper S. These stripes are a 2 step installation. The accent stripe and outlined "S" will be one graphic. The solid horizontal stripe and COOPER lettering will be the second graphic. If you're unsure how to install it may be best to have them professionally installed. The photos you see were installed by a happy HouseofGrafx customer! *Please note* - The "COLORS" dropdown menu is for the thicker middle stripes (shown in white on this Mini). Use those same available "colors" to specify your "pin stripe color" which is shown in red on this Mini! Ask all questions before purchasing please!